All can be accessed via your Dropbox account. 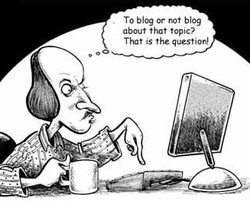 The purpose of a blog: reflection and feedback. Reflection about what you've learned or what sparks your imagination or a video you watched; feedback from others to sharpen your understandings and clear away misconceptions. The assignments will vary in purpose and by course (see the How-to Guide & Blog Source & Requirements under Home). Take advantage of the opportunity to explore ideas; communicate with others; express your individuality; author something original.